The following figure shows some examples of alternate interior and alternate exteriors angle pairs. Scroll down the page if you need more examples and explanations about alternate interior angles and alternate exterior angles. When a line (called a transversal) intersects a pair of lines, alternate interior angles are formed on opposite sides of the transversal. If the pair of lines are parallel then the alternate interior angles are equal to each other. When two parallel lines are cut by a transversal, the resulting alternate interior angles are congruent. How to identify Alternate Interior Angles? How to use the Alternate Angle Theorem to find missing angles? In general, the diagram will be as shown below. The small and big pair of angles are supplementary (i.e. small + big = 180°. Therefore, given any one angle you would be able to work out the values of all the other angles. How to identify alternate interior angles and their properties? A transversal is a line that passes through two lines. Alternate interior angles are angles that are on the inside of the two lines, and on the opposite sides of the transversal. If the two lines are parallel then the alternate interior angles are congruent. How to solve for x using Alternate Interior Angles? How to solve for x using Alternate Interior Angles and Alternate Exterior Angles? If lines are parallel then corresponding angles are congruent, alternate interior angles are congruent and alternate exterior angles are congruent. If lines are parallel, then same side interior angles are supplementary and same side exterior angles are supplementary. This video will prove that Alternate Interior Angles are congruent by using the Corresponding Angle Postulate. How to prove the Alternate Interior Angle theorem showing that when lines are parallel, alternate interior angles are congruent? What is the Converse of the Alternate Interior Angles Theorem? How to prove of the Converse of the Alternate Interior Angles Theorem? This video shows a proof of the alternate interior angle converse. When two lines are crossed by a transversal, the opposite angle pairs on the outside of the lines are alternate exterior angles. If the two lines are parallel then the alternate exterior angles are congruent. One way to identify alternate exterior angles is to see that they are the vertical angles of the alternate interior angles. 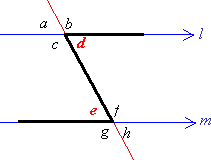 Alternate exterior angles are equal to one another. 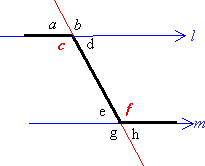 When two parallel lines are cut by a transversal, the resulting alternate exterior angles are congruent. This video shows how to identify alternate exterior angles and their properties. Find out how to locate alternate exterior angles and the characteristics of alternate exterior angles. How to find an angle using alternate exterior angle? Proof and definition of alternate and exterior angles with a transversal and parallel lines. If two lines are cut by a transversal and the alternate angles are congruent, then the lines are parallel. This video shows a proof of the alternate exterior angle converse.